Just one well-placed slice into a particularly pungent onion can send even the most seasoned chef running for a box of tissues. Now, this humble root vegetable is proving its strength outside the culinary world as well—in an artificial muscle created from onion cells. Unlike previous artificial muscles, this one, created by a group of researchers from National Taiwan University, can either expand or contract to bend in different directions depending on the driving voltage applied. The finding is published this week in the journal Applied Physics Letters. The onion epidermis—the fragile skin found just beneath the onion's surface—is a thin, translucent layer of blocky cells arranged in a tightly-packed lattice. Shih and his colleagues thought that onion epidermal cells might be a viable candidate for the tricky task of creating a more versatile muscle that could expand or contract while bending. To date, Shih said, artificial muscles can either bend or contract, but not at the same time. 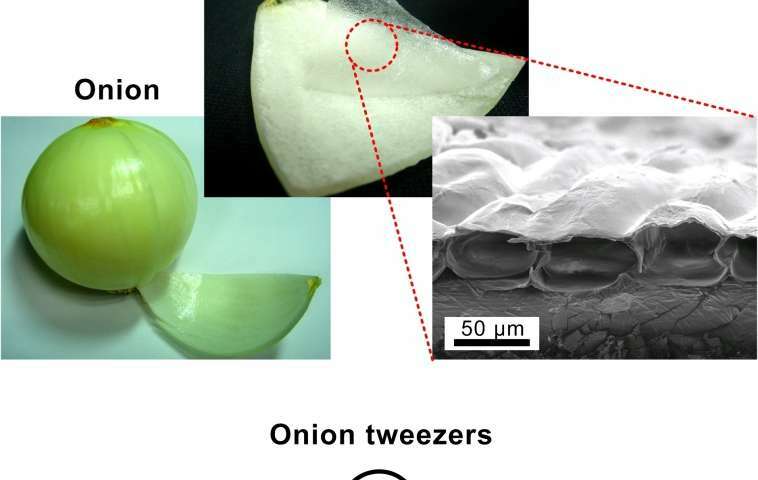 More information: "Onion artificial muscles," by Chien-Chun Chen, Wen-Pin Shih, Pei-Zen Chang, His-Mei Lai, Shing-Yun Chang, Pin-Chun Huang and Huai-An Jeng, Applied Physics Letters , May 5, 2015. scitation.aip.org/content/aip/ … 18/10.1063/1.4917498.